After years of searching, Yale University astronomers have discovered a window into the early, violent formation of the nuclei of the Universe’s monster galaxies. After spotting a potential candidate with the 2.4-meter Hubble Space Telescope, the team of astronomers pointed the 10-meter Keck II telescope, operated by the W. M. Keck Observatory, to witness the turbulent, star-bursting galactic core forming millions of stars at a ferocious rate. The data collected during their five day run in Hawaii offers important clues about the galaxy’s development as it was 11 billion years ago — just 3 billion years after the Big Bang. The research is being published today in the journal Nature. Galaxy formation theories have long suggested that monster elliptical galaxies form from the inside out, creating their dramatically star-studded central cores during early cosmic epochs. But scientists had never been able to observe this core construction — until now. Only the most powerful telescopes have the ability to look back far enough to gather this important insight. After finding the candidate, officially named GOODS-N-774, with an infrared camera on the Hubble Space Telescope, team members flew to Hawaii on the night of Jan. 11, 2014 and actually saw the formation process underway with the Near Infrared Spectrograph (NIRSPEC) instrument installed on Keck Observatory’s 10-meter Keck II telescope. Informally, they began calling the GOODS-N-774 galaxy, “Sparky.” Using archival, far-infrared images from NASA’s Spitzer Space Telescope and the ESA/NASA Herschel Space Observatory, the team found Sparky is producing 300 stars per year. By comparison, the Milky Way produces about 10 stars per year. While the tiny galaxy is only 6 percent the size of the Milky Way, it contains about twice as many stars. Sparky’s rapid gas movement — predicted by the theorists — was the big tip-off that they found what they were looking for. Observations from Keck Observatory showed the galaxy boasts the most rapidly orbiting gas clouds ever measured, the most definitive evidence that they were witnessing the core of a monster galaxy in formation. It was something the team had hoped to see for years, and when the telltale, broad-emission lines showed up on the Keck Observatory monitors, the mood in the room lit up. The gas required to fuel star formation, along with swirling traces of metals, enshrouds the galaxy in thick dust, hiding it in visible light just like the Sun appears red and faint behind the smoke of a forest fire. 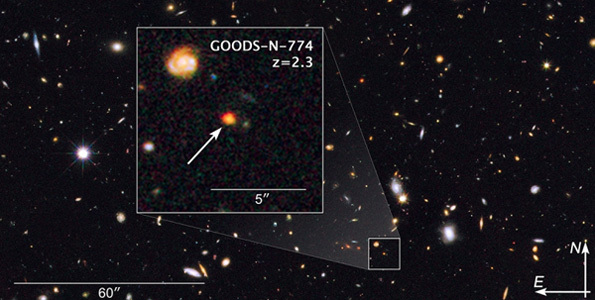 The astronomers think that this barely visible galaxy may be representative of a much larger population of similar objects that are even more obscured by dust. It was only by using infrared analysis and the most powerful telescopes in existence that the Yale team could confirm the exact nature of Sparky. The galaxy formed 11 billion years ago, and its star-forming gas has one of the highest ionized gas velocity dispersions ever measured. Sparky may have a lot of company. “We suspect there are 100 times as many and we’re just missing them,” Nelson said. NIRSPEC (Near-Infrared Spectrograph) is a unique, cross-dispersed echelle spectrograph that captures spectra of objects over a large range of infrared wavelengths at high spectral resolution. Built at the UCLA Infrared Laboratory by a team led by Prof. Ian McLean, the instrument is used for radial velocity studies of cool stars, abundance measurements of stars and their environs, planetary science, and many other scientific programs. A second mode provides low spectral resolution but high sensitivity and is popular for studies of distant galaxies and very cool low-mass stars. NIRSPEC can also be used with Keck II’s adaptive optics (AO) system to combine the powers of the high spatial resolution of AO with the high spectral resolution of NIRSPEC.